An exhaustive collection of swinging blues drum loops ideal for folk, bluegrass, and Americana Roots styles of music as well as classic blues and country rock tracks. With shuffles, 12/8 patterns, and other swing feels, this collection of live studio drums offers the right grooves for artists who need solid, no-frills grooves. Need some shuffle and swing in your drum tracks? 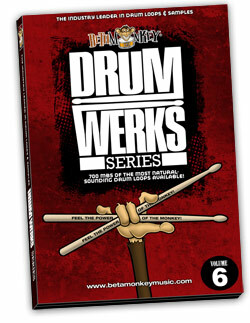 Drum Werks Volume VI is part of Beta Monkey’s hugely popular Drum Werks line and will deliver the swing patterns, shuffles, and triplet-based grooves you need. All delivered with a natural, live mix that will sit as nicely behind acoustic as it will electric guitars. A thoroughly versatile and complete triplet and shuffle-based drum loops package to create new blues, blues-based rock, and alt-country drum tracks. Featuring over 700 acoustic drum loops in 18 different groove sets, from 6/8 blues ballad grooves to driving 180 BPM rock shuffles, if you are looking for classic blues 12/8 feels, shuffles and blues rock swing grooves, Drum Werks VI has the feel and sound you’re after. 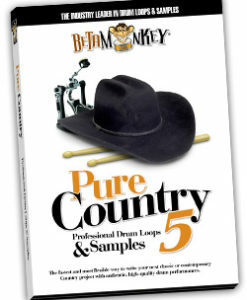 These loops will quickly and easily become your drum tracks for for a wide variety of blues and country projects. A complete matching multi-velocity drum and cymbal sample set is also included. Available in WAV, AIF and REX2 versions. Full Range of Drum Loops and Samples for Blues, Blues-Rock, and Country Rock: All rhythms are aimed for songwriters writing classic blues and country rock tracks. Shuffles, 12/8 patterns, and other swing feels are the focus for all groove feels. Comprehensive Groove Folders: Grooves sets are arranged logically and with healthy coverage of various tempos ranging from 50 BPM all the way up to 180 BPM. Cohesive Drum Sounds: All loops are taken from the SAME recording session (all grooves, fills, etc. are sonically-matched). You will get all the grooves, groove variations, fills, and one shots to create your next blues and country track and you can mix them with anything else on the disc. Tired of loop sets where the sounds vary from one folder to the next? – or worse, from file to file? Drum Werks VI will take care of that. Fully-Sampled Drum and Cymbal Samples: We took the kit used in the recording sessions and sampled it from head to toe! The sample kit section includes multi-velocity samples of all the drums and cymbals recorded. While most loop discs offer only a handful of single hits, we have given you the entire kit: from the softest taps to the most powerful slams, you have it all. You use the Drum Werks VI sample kit to build grooves from scratch or use them to augment any of the 700 loops. This disc gives you the flexibility to do just that. Compatible with Drum Werks V: Same session, same versatile drum sound. Only the snare voice was changed for Drum Werks V.
735 (561 MB) original, license-free 16/44, 24/44 drum loops and samples. Available as 16-bit, 24-bit ACIDized WAV” APPLE LOOPS (AIFF), and REX2 loops. 201 (95 MB) multi-velocity drum and cymbal samples. ALL available ACIDized WAV, APPLE, and REX2 formats included in download and for hard copy DVD purchases. Well, as usual these loops rock as good as ever. These really are great loops and I hope to send you some of the music that I’ve created using them. Keep up the great werk and you’ll always have a loyal customer with me. Thanks again. Cool… new loops. I love all the other sets I have already bought from you…. keep up the good work!! The Drum Werks VI loops sound great. They’re just what I asked you for a year ago. I’m REALLY looking forward to working with these. I also think it’s great of you guys using .wav files for the preview! People can download them and try them right in the context of their project. Thank you. 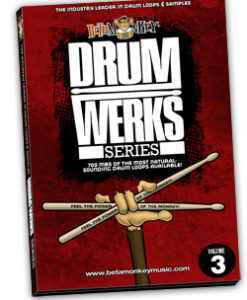 I love Drum Werks VII… it’s the best collection yet (followed by Double Bass Mania)! I think I’ll use these more than all of the other collections put together (and I have almost all of them). Thanks again for getting me the disc! I finally settled in using your loops from Drum Werks VI, and gotta say I’m verry happy with your product. Having purchased Drum Werks III, VI and Natural Grooves, I got enough pro session work to keep me occupied for months (or more! ), FOR $50.00! Thanks for being apparently the only guy out there putting loops together for more than the techno-remix crowd. I just got my Drum Werks VI and loaded it into Logic… I am so impressed with the quality and versatility of these loops… wow. Talk about bang for the buck! My teacher is going to be so happy that I finally have some proper drum tracks to use for our BLUES lessons! Just wanted to thank you for the excellent product.